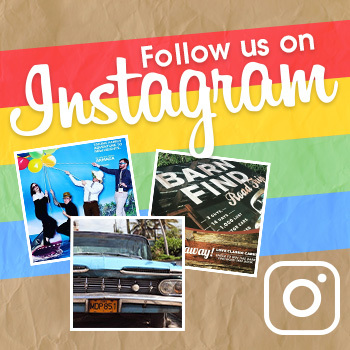 Road trips are an iconic American pastime. There’s no feeling better than rolling down your window as you drive down the sunny Californian coast or through the beautiful fall foliage of New England. To celebrate the American road trip, Kia has introduced six new concept cars at the 2015 SEMA Show. Each new model honors a specific region that is considered the perfect road trip destination. During the fall, many regions throughout the United States turn into a beautiful display of yellows, oranges, and reds, showcasing nature’s color—but there is no place better to see this awe-inspiring display than the Northeast. It is this region that has inspired the Photo Safari Sedona. The minivan is the perfect companion for any photographer or family looking to capture the beauty of the Northeast region with a color scheme that reflects the regions’ own colors. 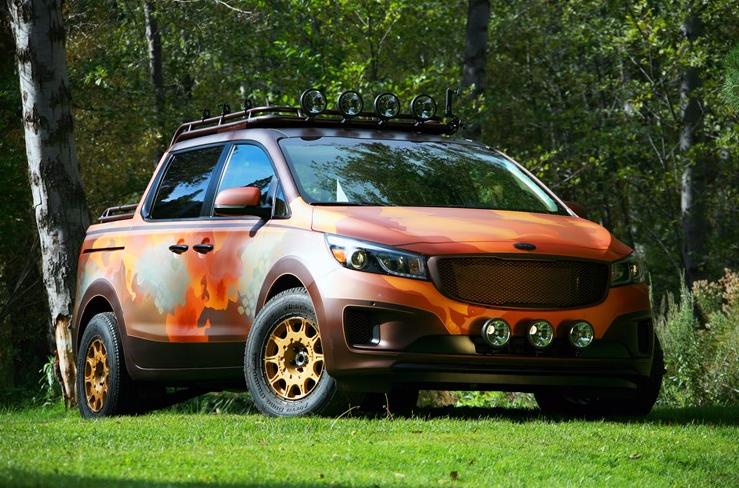 Kia has also reduced the eight-passenger minivan to a two-passenger body, making it off-road capable, while a custom fabricated steel roof rack allows for photographers to mount traditional DSLR cameras. It even has a place where a photographer can be secured to the outside of the vehicle, giving him or her the opportunity to take pictures as another person drives. Though this customized minivan made an appearance at last year’s SEMA Show, the Ballast Point Sedona is back and better than ever. 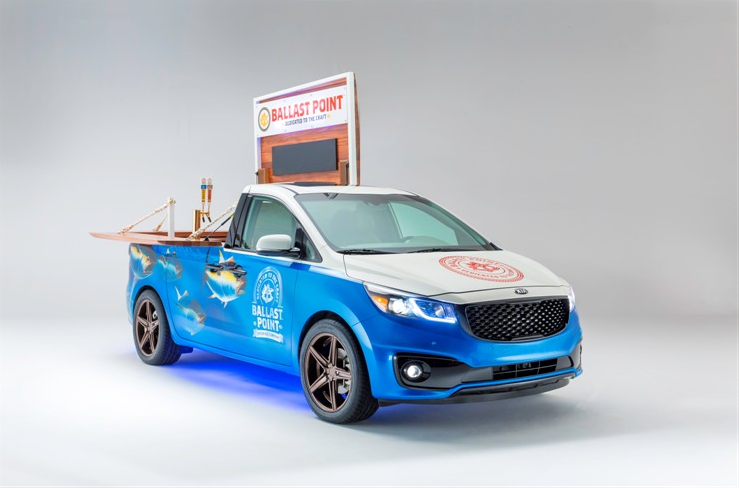 Representing California’s sunny, laid back disposition, this Sedona model is a result of a partnership between Ballast Point Brewing & Spirits and Kia. It is capable of serving premium handcrafted beers from the San Diego-based craft brewery. The Sedona has once again been reduced to a two-passenger minivan, featuring a hand-formed solid mahogany shell with a roof and fold-down front bar. It is equipped with two Micro Matic taps, a jockey box with 120-feet of copper beer-cooling coils, and plenty of storage. Kia’s SEMA lineup would be lost if it didn’t have at least one Soul concep car, which is where the Trail’ster concept comes in. 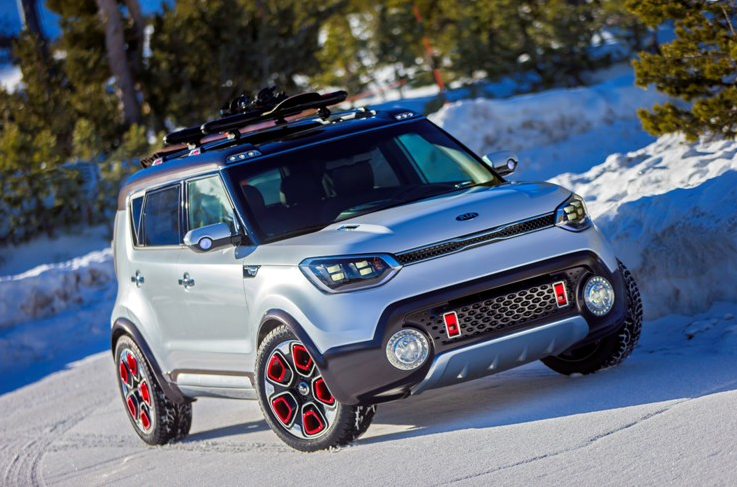 This turbocharged Soul is tricked out with a Polar Bear Snowdrift and Terra Bronze Metallic two-tone paint scheme, a roll-top canvas roof, and armored aluminum skid plates—all to capture the capabilities of a CUV to honor the Rocky Mountains. The Trail’ster is for those consumers that like to leave urban sprawl behind every once in a while and explore the rougher elements of the Rocky Mountains. As an efficient and lightweight alternative, the Trail’ster is the perfect car for adventurous urbanites—especially with its all-wheel drive capability.